Multi-purpose recliner cushion is ideal for anyone who spends long hours in a recliner. Chair pad's half-moon shape supports the lumbar area, under legs, or behind the neck. 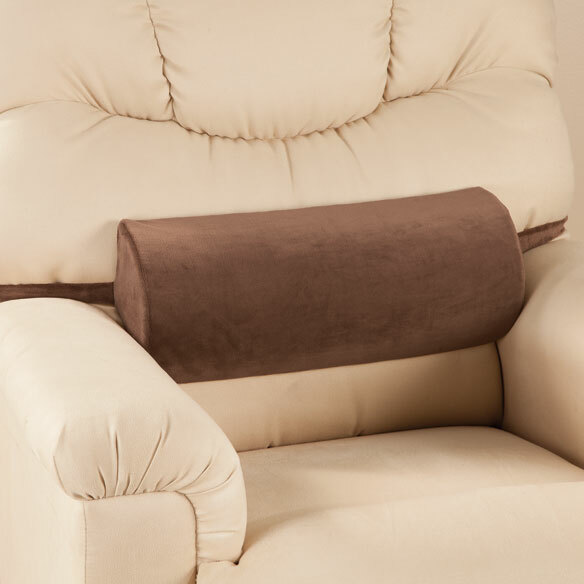 Soft, removable velour recliner pad cover features an extra-long elastic strap that fits around recliner back to keep cushion in place. High-quality memory foam recliner cushion keeps its shape. Fills gap between chair seat and back when reclined. 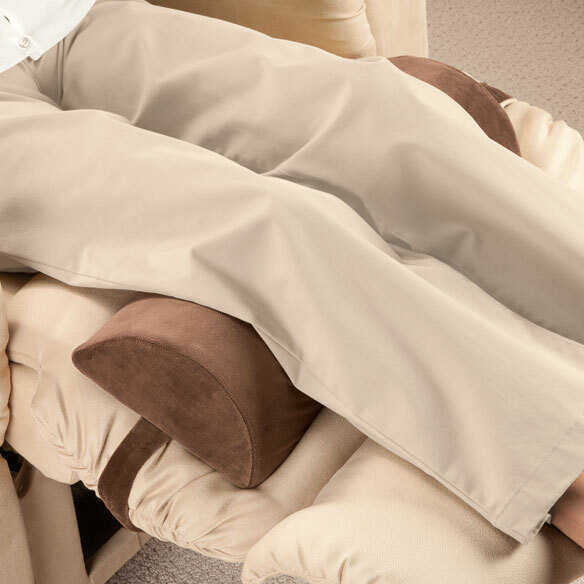 Elevates feet when used on recliner foot rest. Machine washable, 100% polyester cover. 19 1/2"L x 8"W x 4"H.
Dark brown color matches our OakRidge Comforts™ sherpa protector (sold separately). 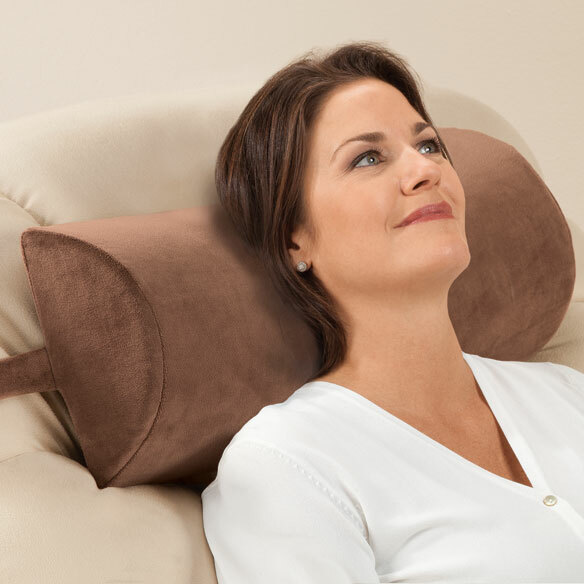 The pillow stays put and provides excellent support for those with neck problems. I sleep in a chair every night and this pillow is a God send. Because I sleep in my comforter every night, due to having had back surgery, these cushions increase my comfort. Even with sitting daily in this recliner and using them on occassion as a head rest during the day... I own two of them. One for lumbar support and the other as a head rest. You will not be dissappointed in how they are made and/or how they can be used. So glad I found them. And knew they would be beneficial to me the first time I saw them...As all previous attempts at finding the right support for my back had failed. These are great. With a big plus....They stay in place. This works very well to elevate my feet and stays in place even when the recliner footrest is down. I was using a pillow but I had to keep rearranging it and then it would fall off when I lowered the footrest. This eliminates those problems. Very happy with my purchase! excellent quality and fair price . work well with my leather recliner . I originally bought one of these cushions for my recliner for my neck. I liked it so well that I purchased another for the lumbar area. My neighbor tried it out and I also ordered one for her. The memory foam is nice and keeps its shape. I like the washable cover and the fact that it has a strap that holds the cushion in place. It does slip a bit at the upper part of my recliner but it may be because I have a petite recliner. I will just pull it tighter and put a pin on the strap that should hold it in place better. This pillow allows me the ability to fully recline and still watch tv. The strap is no big enough to go around my recliner. It is soft, but it just doesn't feel as I hoped it would. I sleep frequently in my recliner and this should be more comfortable than my current very old neck cushion. I want my head to feel more comfortable in the recliner. Exactly what I've been looking for to use with recliner both for neck and for legs. Had recent neck surgery. The little pillow I have now falls behind my back if I move. I needed something to rest my neck on. I just bought a power lift recliner and the head rest isn't large enough for my preferences. Looking for a support for legs in recliner instead of a pillow. My chair hit me at an awkward angle. I chose this product to eliminate this problem. My husband has muscle issues in his back and this will help him when he sits in his recliner. I'm hoping it will fill in a section of my recliner that has lost its stuffing. I chose this cushion for my 87 year old father to use on his recliner when watching TV. my husband uses a pillow behind his head in his recliner & it keeps falling off onto the floor. Maybe this will stay in place. looking for back support while reading. Great for elevating legs in a reclining chair. Looked like what I wanted and it had good reviews. Also liked the brown color to match my couch. My recliner couch foot rest's stuffing has shifted to such a state that it hurts my feet and legs to rest on it. By slipping this cushion over the unhappy section, my comfort level not only is restored, it's improved beyond the original comfort level. Having trouble with my neck when I sit on the recliner so I thought I would give it a try. Reviews were for the most positive. Looking forward to receiving this and really hoping I made a good purchase? what is the length of strap? BEST ANSWER: Thank you for your question. The strap is 37" long and can stretch up to 48". We hope this information will be of help to you.